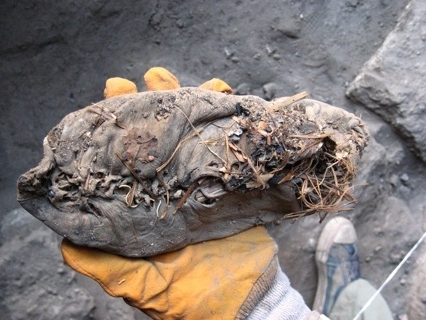 If you’re wondering what your Converse or Nikes will look like in 5500 years, then wonder no longer. In a cave in Armenia, about an hour south of the nation’s capital Yerevan, near the border with Iran and Turkey, prehistoric archaeologists lead by Ron Pinhasi from the University College Cork in Ireland have stumbled across the mother lode: a prehistoric leather shoe from 3500 BC that is the oldest leather shoe ever discovered, and the second-oldest shoe ever found after a pair of 7500-year-old fiber sandals. So why was the show back there? Well, possibly, it was a shoe meant for the gods. “We thought originally it could be a discard, but at the same time, it’s very strange, because we have only one shoe, and it’s in very good shape,” Pinhasi said. “It looks like it was more than likely deliberately placed in this way.” Found back in the cave with the shoe were several pots full of grain and three pots each containing a child’s skull with the jaw removed. Weird! I bet those shoes are pretty rank now, huh? Roughly, they’re a size five, so they were the property of either a woman or an ancient jockey.